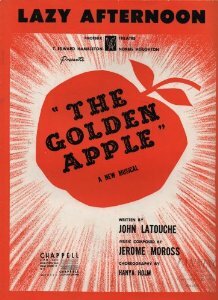 “Lazy Afternoon” was written for the 1954 musical The Golden Apple, which uses mythological Greek characters from Ulysses but set in the state of Washington (at Mount Olympia, of course) in the United States. This song, as well as the entire score, is quite beautiful. Lazy Afternoon was recorded on June 27, 1957 and released in 1957 on the album The Beat of My Heart. It was arranged by Ralph Sharon. “Lazy Afternoon” was recorded live at Tony Bennett’s concert at Carnegie Hall on June 9, 1962 and was initially released in 1962 on the album Tony Bennett at Carnegie Hall. Ralph Sharon arranged the song.